Nice 2 bedroom apartment, located in the popular resort of Marina Duquesa with everything you could wish for including long sandy beaches, vast range of popular restaurants and coffee shops. Easy access from both Malaga airport, and Gibraltar airport (50 min and 25 min drive). Never over crowded ideal for family holidays and golfing holidays.The apartment has been upgraded recently, with the purchase of a new comfortable suite in the sitting room and a luxurious bed in the main bedroom. Hi my name is Rick, I have 4 grown up kids and as a family we have always enjoyed holidaying in Spain, and so one day while enjoying a nice relaxing lunch in the Marina we decided to buy our own place having enjoyed a lovely time holidaying in Duquesa which is about a 45min drive on the Motorway from Malaga Airport or a 20min drive from Gibraltar Airport. We fell in love with Duquesa with it's beautiful sandy beach and lovely Marina with a vast selection of restaurants and bars. Why did I choose Duquesa? 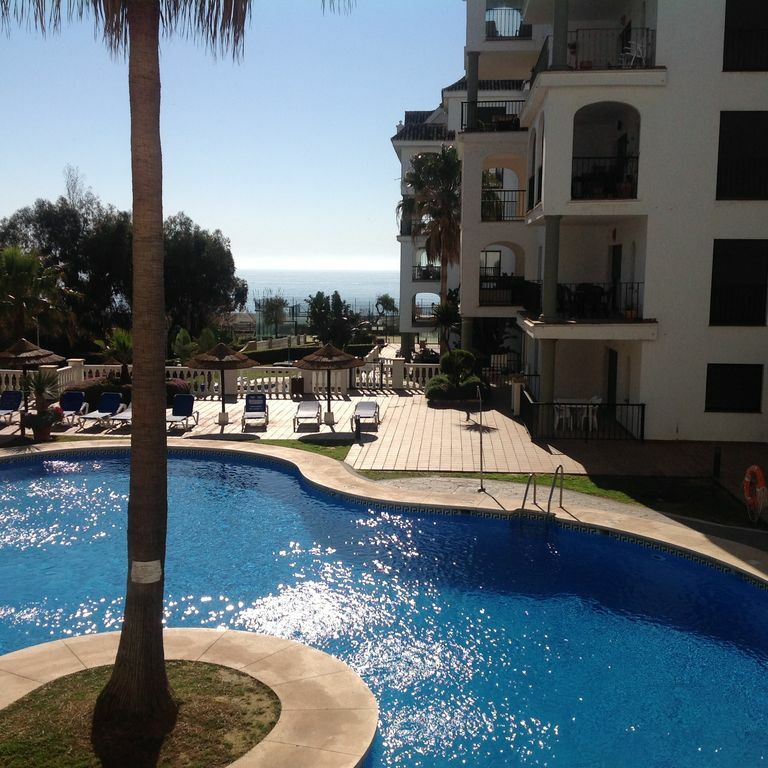 Having looked at a number of properties along the costa del sol we decided that Duquesa with it's lovely Marina and miles of unspoilt beaches was what we where looking for, it is never over crowded and with it's ease of access from both Airports you can be in your apartment in no time at all.As regards a family holiday it is very welcoming for all age groups and you can feel very safe walking around at any time of the day or night. I have been a resident of the area for 10 years now and have seen many changes and improvements over that time. Staying at Marina Duquesa you will enjoy the benefits of 4 swimming pools,access to the beach, Marina 2mins away, 24hr security, modern apartment with air conditioning Sky tv, marble floors nice balcony with sun in the afternoon [ nice to relax after a hard days sunbathing by one of the many pools]. All the gardens are maintained to a very high standard and the complex has full time cleaning staff who are constantly working to keep the complex in pristine condition. En-suite bathroom to bedroom 1 with bath and shower,wc bidet, handbasin. Bathroom No 2 has walk in shower wc and handbasin. The living room and dining room are combined, with 3+2 seater couches, large table lamp, Sky tv, beautiful teak sideboard,and coffee table, modern dining table with 4 chairs.Sitting room leads on to large balcony. Modern kitchen with ceramic hob, built in oven, dishwasher, fridge freezer and of course a nice china tea pot. La Duquesa Golf & Country club which is just across the Road Boasts an 18 hole course designed by Robert Trent Jones, a technical masterpiece with wonder Sea and Mountain views. Further golfing challenges are close at hand, Alcaideas, a links course overlooking the Rock of Gibraltar, Valderama, host of the Ryder cup and world championship, only 15 min drive from Duquesa. Sotogrande, San Roque and La Canada to name but a few. Notes on accommodation: This apartment is kept in pristine condition and we would like to think our guest would appreciate this make every effort to maintain these high standards while enjoying their stay in Duquesa. Outside: The complex has 4 swimming pools, beautiful landscaped gardens,24hr security and direct assess to the large sandy Beach. On your balcony you can enjoy the afternoon sun while relaxing with a glass of wine and your favourite book. Utility Room: Utility room has a washing machine and storage area. Cleaning / Towels / Linen / Maid service: Towels and bed linen are provided,and can be changed on a weekly basis. Cleaning can be organised for longer stays. Other: Nice hall way with storage press with ironing board and some ball games. Marina Duquesa is situated on the coast with a 3 min walk to the nearest beach, and 5 min walk to the Marina. Malaga Airport which is about a 50 minute drive down the new motorway is served by all the leading travel companys, Gibraltar Airport is also close by with about a 20 minute drive to Duquesa. Sabinillas which is a 10 minute walk along the beach is a pretty little Spanish town with a large number of restaurants specialising in Seafood and local meat dishes. Estopona is a 15 minute drive and the popular resort of Porto Banus is about 25 minute drive away. There is a main bank in the port with a number of ATM machines close by, and a 3 min drive in to Sabinillas will give you a selection of banks and large supermarkets.